This was recommended by someone (who I found out later hasn't seen it yet) who said that this is a good film. I watched it not knowing it would be stop-motion clay animation, and it didn't really disappoint at all. It's a Neil Gaiman story anyway. That alone is enough invitation to watch it. Coraline (voiced by Dakota Fanning) just moved to an old apartment home with her very busy parents. As she explores her new home, she finds a small door all bricked up. During the night though, the small door opens to an alternate reality where her "other" parents actually acknowledge her presence and everybody has buttons for eyes. As Coraline realizes she wants to be with her real parents more, Other Mother (voiced by Teri Hatcher who also voiced Real Mother) turns ugly inside out. She must now rely on her instincts plus a little help from her friends to set her real parents and herself free from this otherworldly situation. 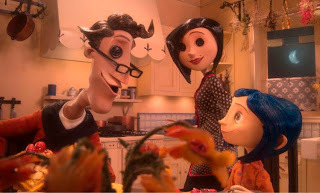 I actually liked the opening credits or the making of Coraline-the-doll (used to spy on her real life by Other Mother). It's like watching Edward Scissorhands do a project─crafty. According to IMDb, this is the longest stop-motion animation, and it was shot in 3D. Kudos to the people behind the film, it's a real sight for sore eyes with the characters and sets' elaborate takes. Stop motion animation rules! But boo to me not having to watch in in 3D, though I don't know if it would have made a diff. I can't help but point out its similarities to Alice in Wonderland─the small door, the cat, the evil mother or queen. I'm not sure if young kids would appreciate a sort of creepy-dark-but-cute graphics, but it's surely watchable mainly because it does not only have a story but its storytelling is also solid for the win (unlike a random dream sequence). Dakota Fanning sounds younger than her real age, but just perfect for her character. It's also refreshing─and surprisingly good─to hear Teri Hatcher not being the "desperate housewife" or Lois Lane. Coraline gets eight out of ten, for a solid story and for taking stop motion animation a notch higher.